Performance is a feature that many people are interested in when they are shopping for a new vehicle. Most manufacturers attempt to create powerful vehicles, but they just can't keep up. 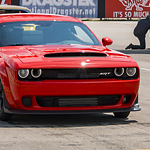 Dodge has been creating the Challenger since 1970, and with great success. There are a number of trim levels to consider. The base level SXT comes with a 305-horsepower 3.6L Pentastar V6 Engine. This engine will provide you with 305 horsepower. That's plenty as it is, but if you are looking for more, you can opt for the Challenger R/T trim level. That is a larger engine at 372-horsepower with a 5.7L HEMI V8 Engine. A few different trim levels are situated in between these two options. The SXT Plus and GT both provide impressive forms of performance with each of their packages.